It is necessary to consider how to clean the air conditioning periodically and not only during the summer. Having the device at home, in the workplace, cinemas, theaters or auditoriums is a privilege, synonymous with comfort and well-being, as well as ensuring good air quality and increase the life of the device. That’s why we have prepared a guide on how to clean the air conditioner for better performance of the appliance, reduce energy costs and keep the air-conditioned environment away from respiratory diseases. Allow the filter to dry naturally or use another soft cloth. Note: Always read the cleaning instructions in the manual of your device and if there are any specific recommendations of the model, there will be all the tips. And do not forget to never connect the unit without the filters. To learn how to clean the air conditioner at home, on your own, it takes a few steps and in a few minutes you will have finished the service. Allow the filter to dry itself. But professional ac cleaning is a must to have. 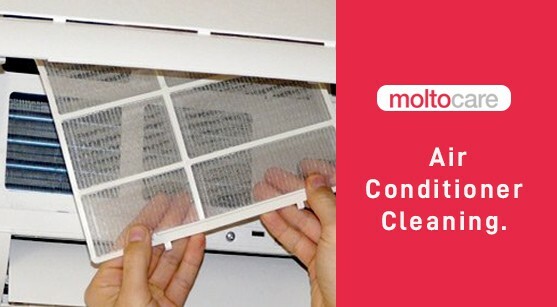 Call us at Moltocare for professional AC cleaning services Dubai.